was built and learn a little about their operations. Our Account Manager, Don Shopp was kind enough to give us a tour of the facility and pointed out some of the features that set them apart. One of the big draws was the fact they are not tied to one particular service provider. The carrier data centers derive their revenue from bandwidth and make the prospect of traffic growth quite expensive. By opening up the data center to a number of carriers, you promote competition and increase resiliency. RagingWire derives its revenue from the amount of power you consume instead of bandwidth. Consequently, they have built in incentives to use power efficiently since power loss equates to lost revenue. Many data centers have problems that stem from the inability to move power throughout the facility. This can happen when a particular area runs out of power, or conversely, when an area fills up with equipment but has untapped electricity. RagingWire has invested in a power switching system that “ships” unused power to other areas of the facility. This gives customers extra flexibility and removes constraints. Today, Data Centers account for ~2% of electricity use. And since coal accounts for about half of electricity production, there is a direct correlation to CO2 emissions. RagingWire has garnered a number of awards for reducing Environmental Impact including LEED Gold, and EPA Energy Star. One particular feature is their automated system that takes advantage of natural cooling. Based on Programmable Logic Controller (PLC) technology, the system mashes up information about atmospheric conditions and current demand and automatically opens up plenums for natural cooling. 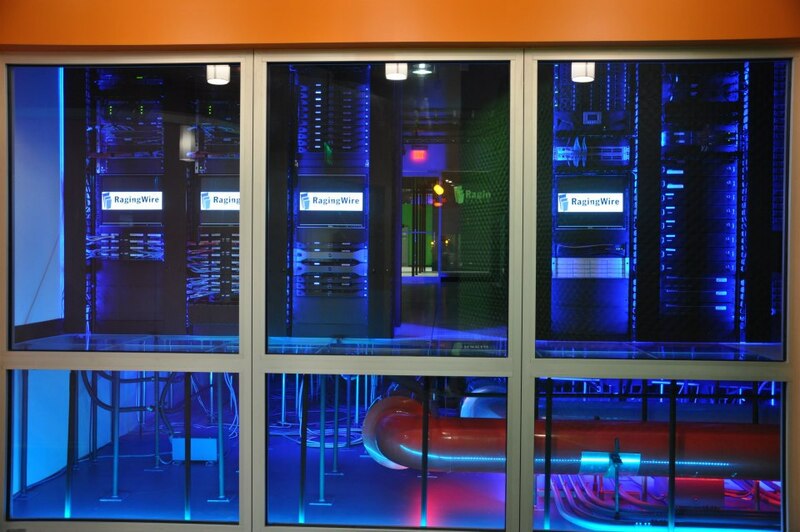 When you think about a data center, you want guaranteed access to your systems. Here is another area where RagingWire shines. They can assure 100% uptime for critical facility infrastructure, even during maintenance windows. Physicial security is vitally important to the folks at RagingWire. The facility is designed to prevent unauthorized or unintended access. You will have to get through 7 physical security barriers before you can ever touch a server. And each server room is color-coded to help technicians orient themselves. It was great to visit the facility and learn first-hand from Don how RagingWire is making hosted solutions a sensible alternative to on-premise data centers.